Kefir is like liquid yoghurt. It is a cultured milk product. Kefir tastes a little like buttermilk (to me). Real kefir is tart, frothy and teeming with beneficial microbes – between 50 to 60 different strains – whereas yoghurt has less than 5. So for people who have suffered health set-backs from antibiotic and antifungal use, kefir is a more powerful rectifier. Store-bought kefir must be pasteurized to stop the culturing process, like many other cultured foods available commercially (even in health food stores). Pasteurization kills the microbes. Then some kefiring microbes (8-12) are added back in. The advantage of commercial kefir is that companies have doctored the taste for those who don’t like the sourness – kinda like is done to yoghurt by adding flavors, sweeteners and fruits. It is a good place to begin especially with children. Real home-made kefir is much more therapeutic having many more microbe strains available for your healing. And home-made kefir is incredibly easy to make – easier than yoghurt since no special temperature regulation is needed. Basically the equation goes like this; kefir = kefir grains + milk + time. Now the details. Kefir grains look like dry cottage cheese but they are in fact a complex housing for the many culturing microbes called a SCOBY (Symbiotic Colony Of Bacteria and Yeast). As such, kefir grains are alive and need to be cared for – as most living things. Milk is their happy home which provides them with their requirements to live and multiply. The result of their living process is kefired milk, curds and whey, or what we call kefir. Cool temperatures retard growth, warmer temps accelerate growth. Freezing and boiling damage the grains. Obtaining kefir grains can be tricky. Ask around or search online. Call your local real health food store. Milk is a much maligned food in health circles because it is blamed for both respiratory and digestive complaints in many people. The offending substance is often the milk sugar, lactose. The kefir microbes feed on the lactose in milk, thus lowering the lactose content and create, amongst other things, lactic acid, a great digestive aide. People who are sensitive to milk are often those whose lactose converting microbes have been subverted by antibiotics and antifungals. Replacing them, by drinking real kefir, mitigates this sensitivity AND many other food sensitivities created by medical intervention. I use commercially available organic milk when making kefir. Raw milk and goat’s milk can also be used but my understanding is that these create a thinner kefir. tablespoon kefir grains. Cover (I use a plastic lid – metal is not advised because of the acids produced), shake and leave on the counter for about 12-24 hours. Some kefir making instructions call for periodic shaking. I don’t think this is a good idea as it breaks up the structure of the internal colonies that are doing the kefiring. How do you know when it is done? Well, mine is done when I see small streaks of clear (actually pale yellowish) whey forming near the bottom of the jar. Some people wait until there is an inch or two of whey at the bottom. When I have done that the kefir is much more sour and less frothy and thick. I like it thick frothy mildly sour. So there is no right or wrong taste, just find what suits your liking and purpose. That is how you tell when it is done. catch the grains. You can enjoy some of the kefired milk right then and then cap it and put it in the refrigerator. It will keep for weeks with a slower fermentation rate. In the other clean jar, put 3 cups milk and the kefir grains rescued in the strainer. Cap, shake and leave on the counter for about 12-24 hours. If I’m not ready for more kefir at this point I just put it in the ‘fridg to slow the kefiring until I need some. How hard is that? 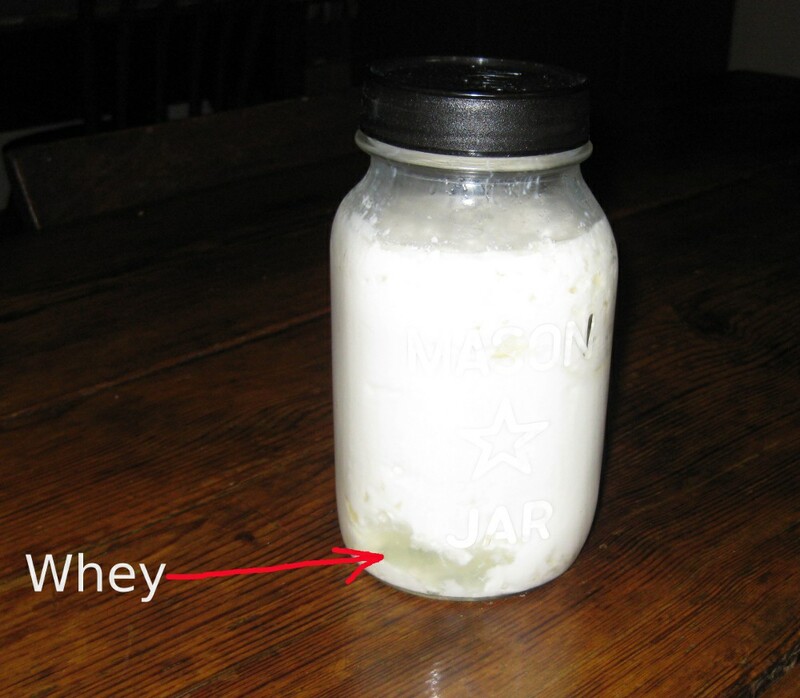 The main indicator of doneness is the amount of whey that forms in the undisturbed jar with the milk+kefir grains. Experimenting with the taste when there is lots of whey versus a little whey will provide you guidance as to when your kefir is done. The time may be more or less depending whether you have placed this jar in a warm or cool environment. Also the time may be more or less depending on the ratio of kefir grains to milk. For example, if you add your 1 tablespoon of kefir grains to 1 cup of milk (instead of 3 cups since maybe you don’t wind up drinking that much) then the milk we be transformed much more quickly. In this case you might want to use just a teaspoon of grains and then preserve the rest of your extra grains in a jar of milk in the refrigerator. If I’m out of town I hibernate my grains in some milk in the refrigerator and then just put them on the counter when I return. I watch for the whey formation to know when the kefir is done to my liking. If you like the kefir extra sour or are making kefir to produce lots of therapeutic whey protein, it is important to know that the longer you leave the grains in the milk, the less lactose there will be which means the less food for your living grains. Some folks will strain out the grains after a moderate amount of whey is produced then allow the kefir to ‘ripen’ on without the grains since the microbes active within the kefir can continue the whey-making process. The grains are then introduced to fresh milk. 1. I find kefir a great meal replacement. If I get hungry at inconvenient times it wonderfully coats my anxious nagging stomach. Some people will add kefir to their morning smoothie or other therapeutic drinks, e.g. their green/fiber drinks. 2. Kefir can be used as a basis for dips and salad dressings where recipes call for a package of spices to be mixed into sour cream or yoghurt. 3. Some people make kefir for the therapeutic benefits of the whey (liquid protein – see research below). In these cases you want to allow the kefir to continue until the maximum amount of whey has been produced. 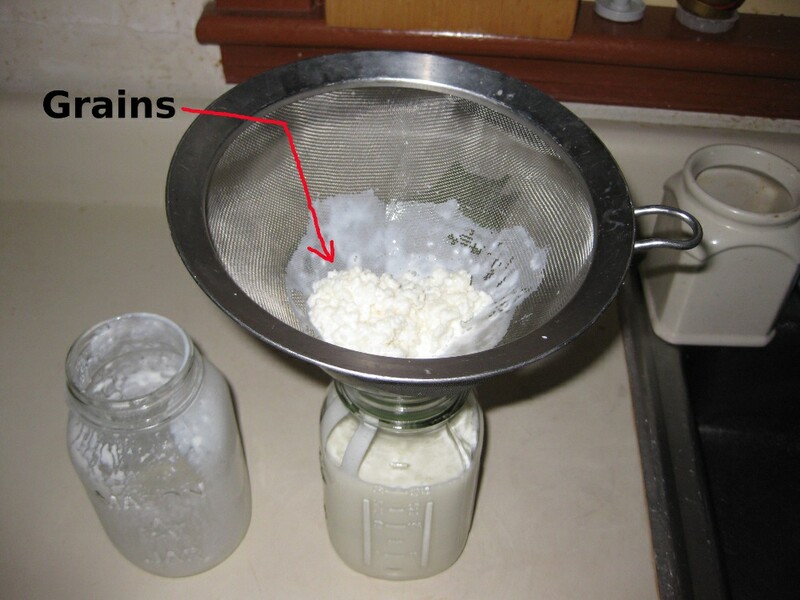 The curds can be separated from the whey and used to make kefir cheese. “I keep whey in a spray bottle in the fridge. I spray it on scrapes, cuts, etc. I gargle with it if I have a sore throat. I swish it if I have gum problems. I also use it for cleaning. Spraying it in the garbage keeps down odors. From Altern Med Rev. 2004 Jun;9(2):136-56. Marshall K.
here? I’d really like to be a part of online community where I can get suggestions from other experienced individuals that share the same interest. If you have any recommendations, please let me know. Kudos! You can go to the Yahoo Groups listing and search for kefir groups like this listing. The most important aspect of Lymes to resolve quickly is fatigue, and that post explains the role of kefir and other probiotics in the list of things that need to be addressed. As you may know, Lymes affects people differently and doing what is recommended on the fatigue post can make a big dif no matter the manifestation. And that is because the body is intelligent and knows what it needed…but it is out of fuel. Oh and there is evidence that blood electrification reverses Lymes.